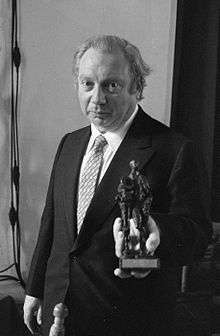 Isaac Stern (Russian: Исаа́к Соломо́нович Штерн; Isaak Solomonovich Shtern; 21 July 1920 – 22 September 2001) was an American violinist and conductor. In 1940, Stern began performing with Russian-born pianist Alexander Zakin, collaborating until 1977. Within musical circles, Stern became renowned both for his recordings and for championing certain younger players. Among his discoveries were cellists Yo-Yo Ma and Jian Wang, and violinists Itzhak Perlman and Pinchas Zukerman. In the 1960s, he also played a major role in saving New York City's Carnegie Hall from demolition, by organising the Citizens' Committee to Save Carnegie Hall. Following the purchase of Carnegie Hall by New York City, the Carnegie Hall Corporation was formed, and Stern was chosen as its first president, a title he held until his death. Carnegie Hall later named its main auditorium in his honor. Among other instruments, Stern played the "Kruse-Vormbaum" Stradivarius (1728), the "ex-Stern" Bergonzi (1733), the "Panette" Guarneri del Gesù (1737), a Michele Angelo Bergonzi (1739–1757), the "Arma Senkrah" Guadagnini (1750), a Giovanni Guadagnini (1754), a J. B. Vuillaume copy of the "Panette" Guarneri del Gesu of 1737 (c.1850), and the "ex-Nicolas I" J.B. Vuillaume (1840). 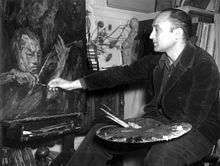 He also owned two contemporary instruments by Samuel Zygmuntowicz. 1 2 3 4 Noam Ben Zeev (1 November 2012), "New Tel Aviv street to honor Isaac Stern." Haaretz Daily. Retrieved 6 June 2013. 1 2 3 4 Allan Kozinn (2001-09-23). "Violinist Isaac Stern Dies at 81; Led Efforts to Save Carnegie Hall". The New York Times. Retrieved 2015-04-12. ↑ K Robert Schwarz (24 September 2001). 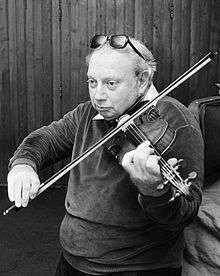 "Isaac Stern". The Guardian. London. Retrieved 10 October 2006. ↑ "Isaac Stern 1920–2001". The Musical Times. ↑ Michael Specter (1994-04-11). "In Musical Odessa, Playing On for the Love of It". The New York Times. Retrieved 2015-04-12. ↑ Kristin McMurran (1978-02-20). "Director Herb Ross and Ex-Ballerina Nora Kaye Know What a Turning Point Is". People. Retrieved 2015-04-12. ↑ "Alexander Zakin, 87, A Piano Accompanist". The New York Times. 16 October 2011. Retrieved 18 December 2011. ↑ "Violinist Isaac Stern dies". BBC News. 23 September 2001. Retrieved 21 July 2007. ↑ Dan Glaister (2004-12-09). "Children in court battle over Isaac Stern's estate". The Guardian. Retrieved 2015-04-12. ↑ Woo, Elaine (23 September 2001). "Isaac Stern, Violinist and Musical Envoy, Dies". Los Angeles Times. ↑ Jeff Bradley (5 December 1999). "Stern, Shostakovich, Gedda stories on shelves". The Denver Post. Retrieved 21 July 2007. ↑ Keough, James. "Stern's Stars." Strings. August/September 2003, No. 112. Booknotes interview with Stern on My First 79 Years, January 23, 2000.